Traveling through Panama for the first time in 2004, I was amazed at the amount of land dedicated to the cultivation of teak. The increasing global appetite for the valuable wood and decreasing amounts of old growth teak available make teak an attractive investment for investors and project promoters, who plant it by the tens of thousands of hectares. Single-species plantations play a critical role in supplying timber to the market more efficiently and relieving pressure on first growth forests. We plant 30% teak in our forests because its cultivation and yield is well studied, and there is established market demand and pricing history. But it’s a non-native species, inhibits native flora and fauna, and isn’t used traditionally or culturally by the small farmers and indigenous communities we work with. One of our goals as a company is to encourage our partners to reforest as part of their overall land management plan, and native species like mahogany (Swietenia macrophylla), spanish cedar (Cedrela odorata) and rosewood (Dalbergia retusa) are more culturally and environmentally appropriate than teak. Cultivating mixed native species is more complex than planting a mono-crop of teak, and hasn’t been as widely studied, so it can be challenging to go against the grain (heh) and not plant pure teak. "... Enhance environmental management and leadership capacity in the Neotropics and tropical Asia by offering capacity-building and networking opportunities to individuals whose decisions and actions influence the management of forests in working landscapes." ELTI plays a critical role in increasing the adoption of native species forestry by helping to fill the knowledge gap about native tree species for plantations and ecological restoration. 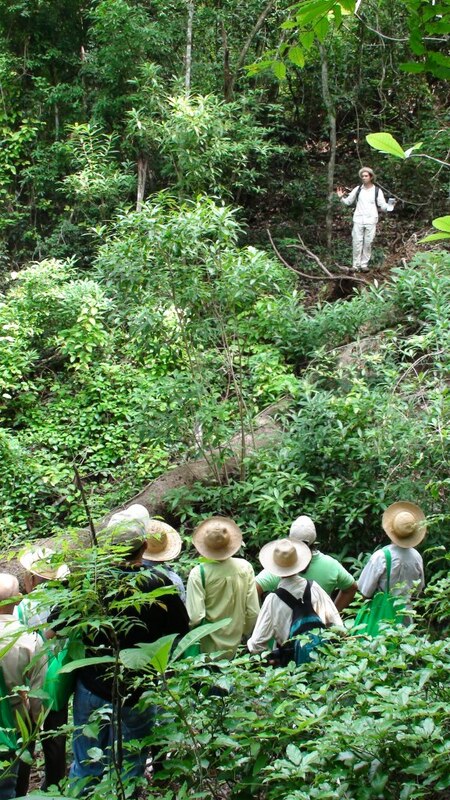 Through field trainings, courses, workshops and conferences, ELTI connects those who have an interest in sustainable forest management and conservation with sustainable strategies and techniques to manage their projects. For example, in February 2013 ELTI facilitated an event celebrating the publication of The Guide for the Propagation of 120 Native Tree Species from Panama and the Neotropics, the first resource to cover such comprehensive information on propagation techniques. The guide is a great resource for those interested in native species forestry, and also those interested in investing in tropical woods. Our employees Liriano Opua and Yen Dogirama commonly reference critical information about seed collection and planting techniques for 120 native species. Since 2008, ELTI, in collaboration with the Native Species Reforestation Project (PRORENA, another Yale F&ES and STRI initiative) has held annual conferences in Panama, focusing on the conservation and restoration of forest ecosystems and biodiversity in the Neotropics. These conferences have been critical in bringing together experts and practitioners in order to share knowledge and experiences. We have participated in these conferences and gained important information as well as fostered friendships with experts who have helped us further improve our business. With our model of planting mixed native species trees and working with small communities to promote sustainable land management, we benefit from the knowledge brokering that ELTI provides. We’re already using techniques from their workshops on silvopastoral and agroforestry systems in order to demonstrate the financial and social benefits of such a holistic approach to forestry. We look forward to utilizing their resources in the future. For more information about ELTI and their events, check out www.elti.org.